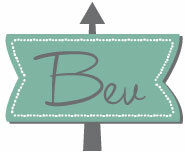 I have a super easy – and super customizable necklace for you today! 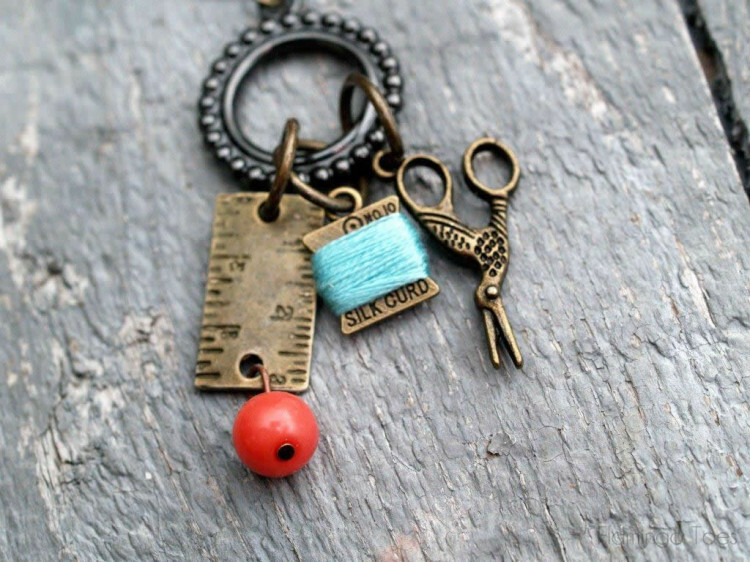 This sweet little Simple DIY Charm Necklace is decorated with some sweet little sewing charms. 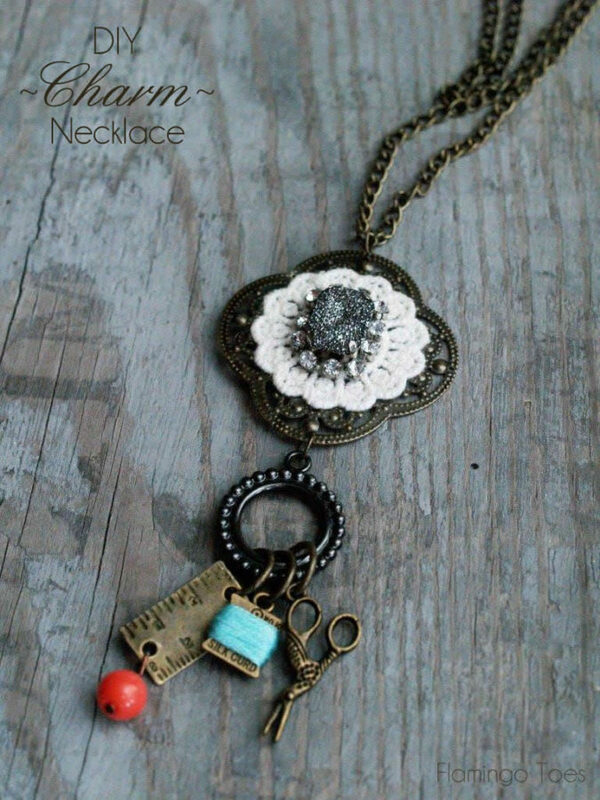 But you can definitely make this necklace with any cute little charms! 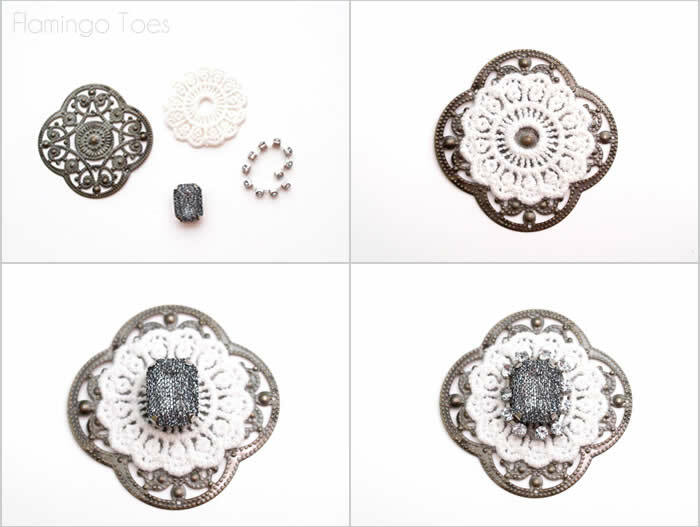 You can use any combo of little metal shapes, beads, charms – whatever you want! Wouldn’t this make a great gift too? Most of these supplies came from Etsy shops – they have pretty much anything you’d need for putting together really unique and fun necklaces. And the great thing, is that most of these are sold in multiples. So you can order a few different things and make up several gifts at once! Here’s my materials list – but use whatever you want to create your own individual piece! 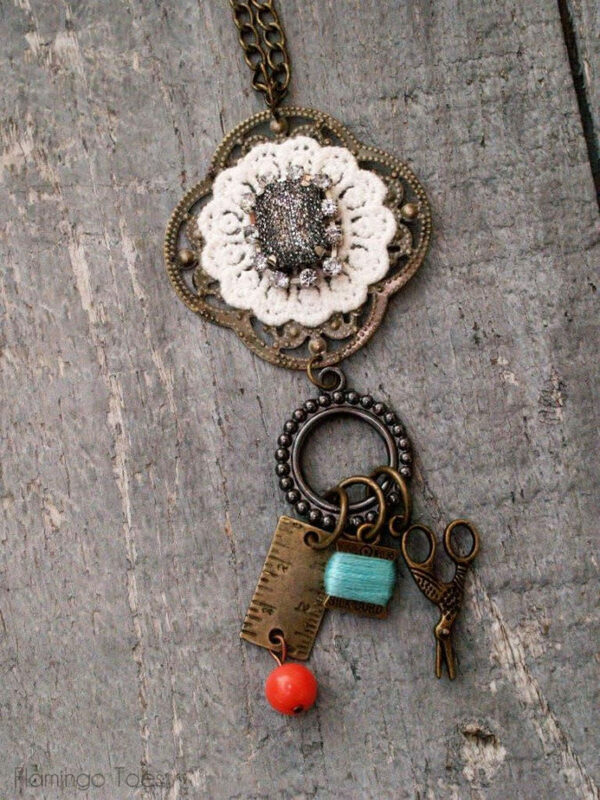 Also – I’ll link to the shops I bought mine from but there are lots of shops on Etsy that carry these types of things! Start by assembling your top piece. 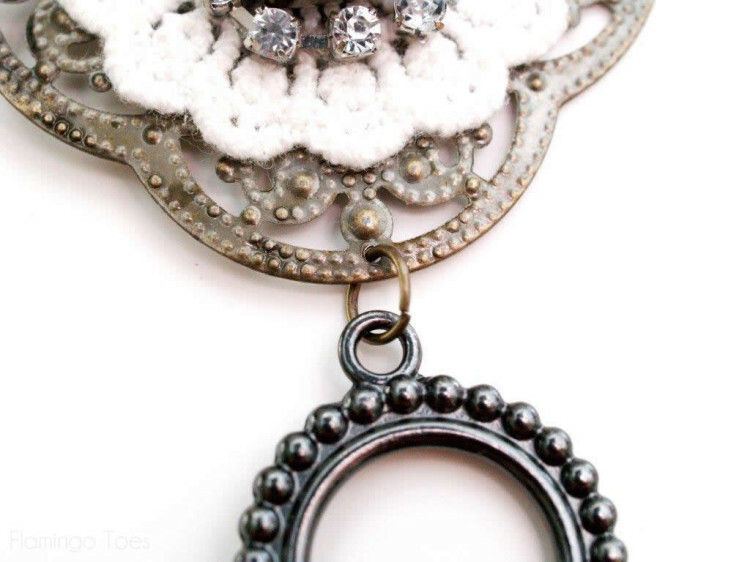 You’ll need a metal piece, a decorative crochet circle, a bead and a small bit of rhinestone strand. 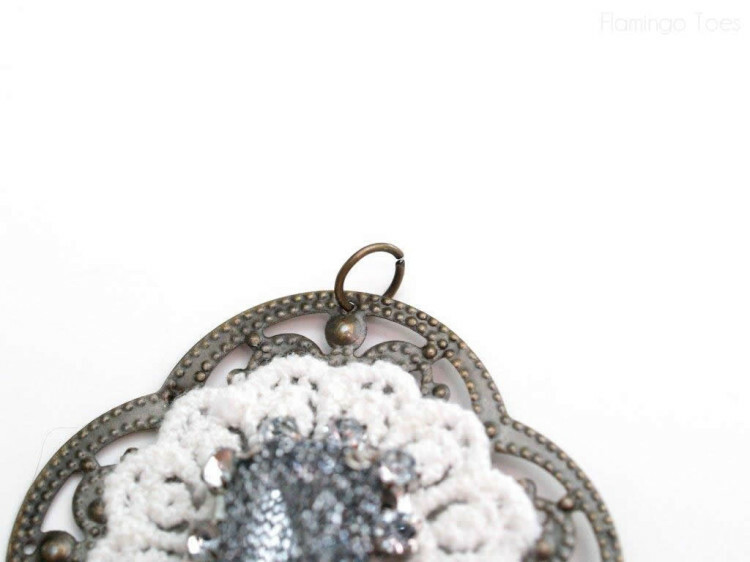 Glue the crochet piece to the metal backing. Then glue on your bead, then wrap your rhinestone strand around it. 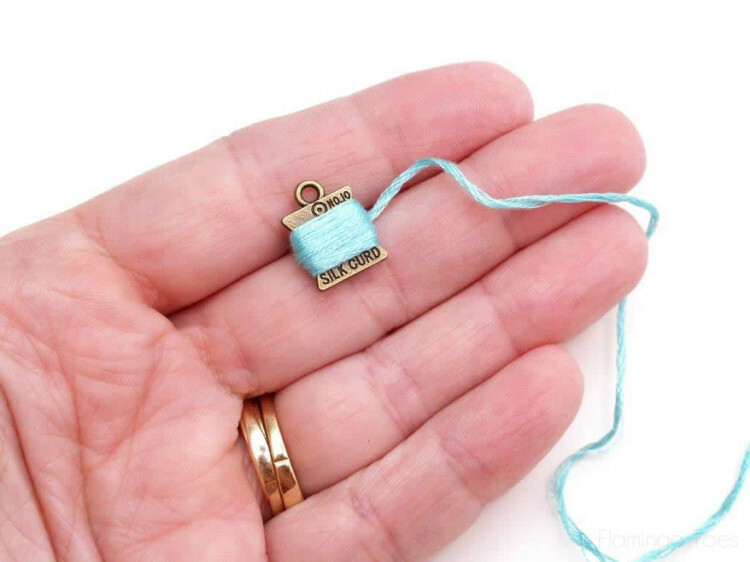 To dress up the sewing charms a little, wrap a small bit of embroidery floss around your little thread charm. Glue the floss in place on the back of the charm. 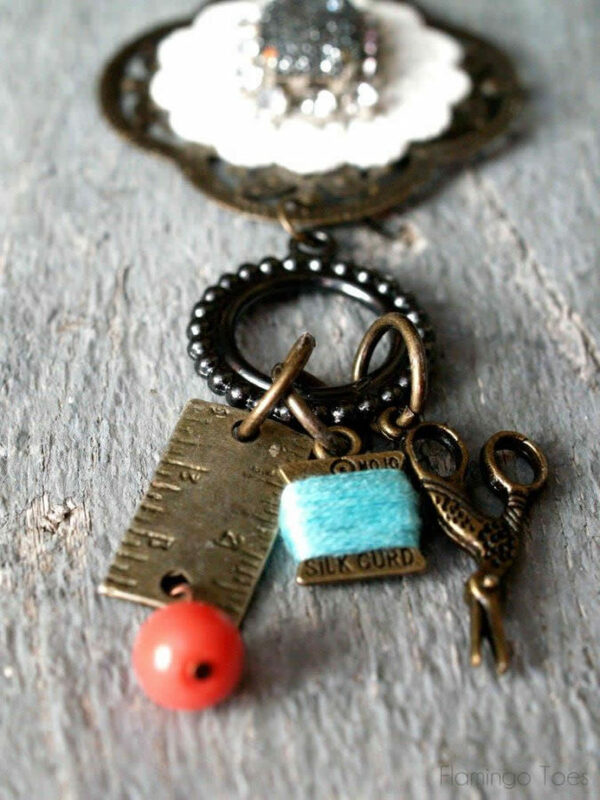 This charm says “Silk Cord”. Not silk curd. Which is weird. And not at all sewing related. Add a small bead to a head pin and form a loop. Instructions for that are on the How To Do That – Jewelry Page if you need them. 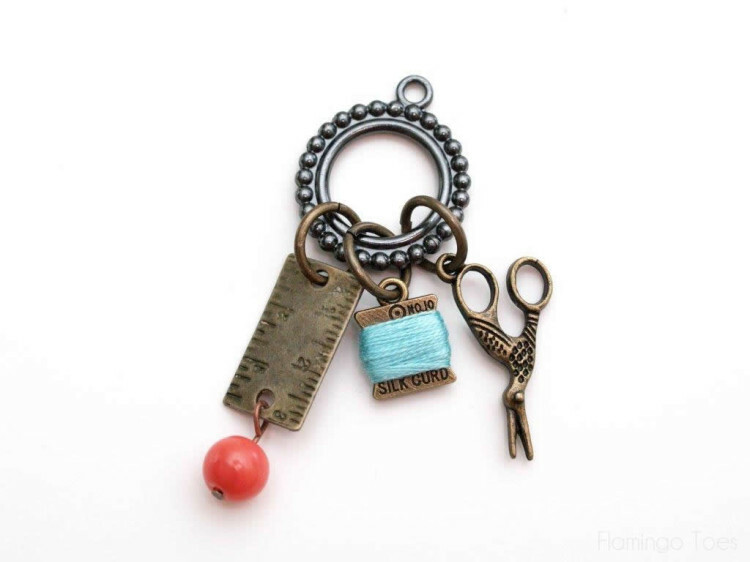 Place the loop of the bead on the bottom of the measuring tape charm. 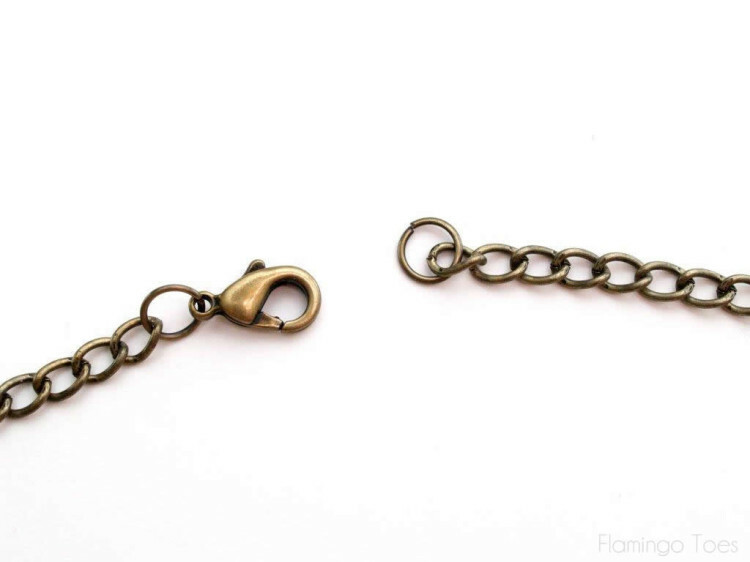 Place all your charms on large jump rings, and add them to your metal loop with the ring. Connect the two pieces with a small jump ring. Place a jump ring through the whole at the top of the metal piece. Thread your chain through the ring and add a lobster clasp and jump ring to the ends of the chain. That finishes off your necklace! These are so fun to change up! 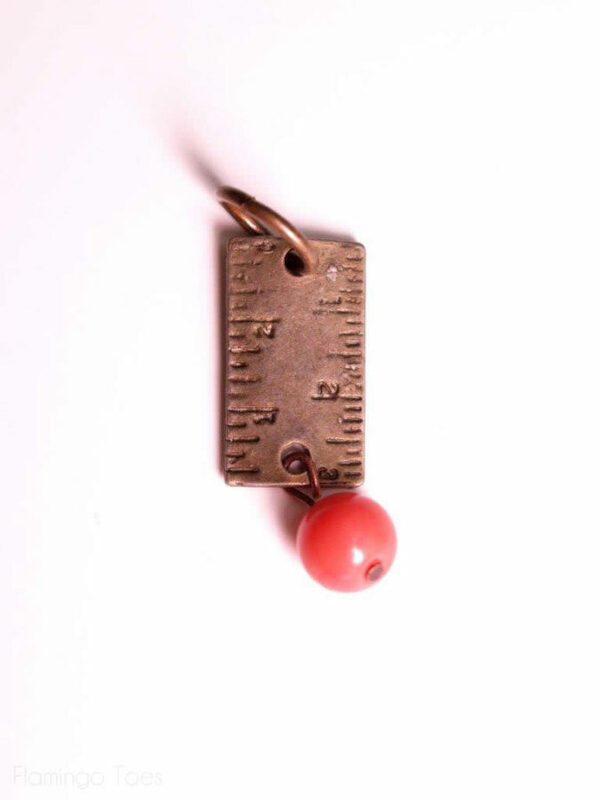 I’ve made up a travel charm necklace – and an Alice in Wonderland version too! They make such great gifts. Hi, i tried to follow the link for the crochet piece, but that shop has no items like that. I searched crochet circle, crochet piece & just crochet. Do you know of any other shops to try? Hi again Barbara – I just heard back from Jessie at Ingredients for Lovely and she’s renewed that listing for the crochet pieces. So you can find them in her shop now. This is so cute! I love how you dressed up and personalized the charms and added some color at the same time. Beautiful! This is so cute! Definitely something I would wear. Thanks for easy to follow instructions. You find the cutest Etsy shops to buy supplies from! 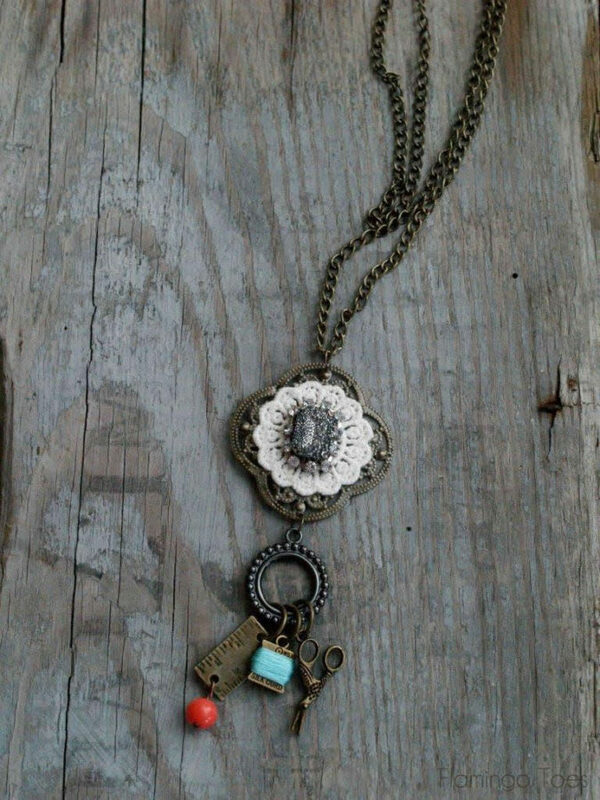 I am LOVING this darling charm necklace! Silk curd and all. ;) All of the little pieces go together perfectly! If I wore that I know that someday I would be using the tiny bit of thread while I was out and about! Just like when I was a kid and tore apart my duct tape wallet to use a strip of duct tape.. 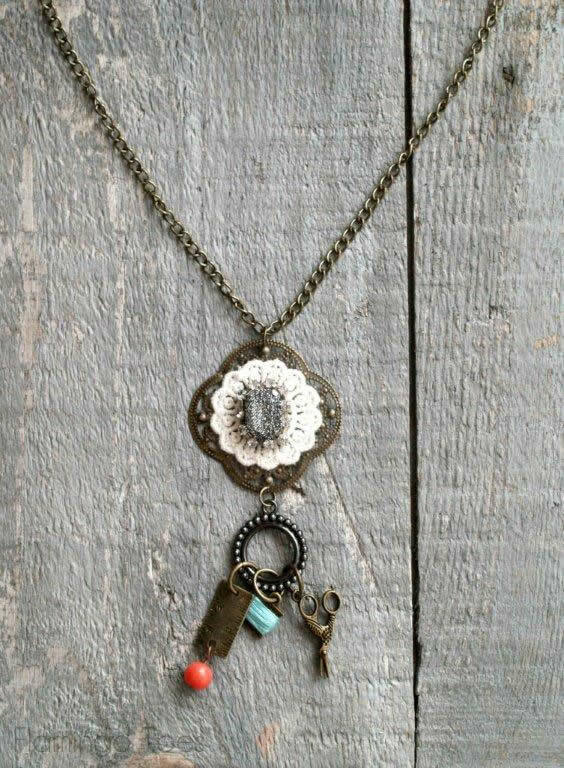 Very cute necklace, I love how unique it is, no one else will ever have one like it unless of course they are copying yours! Hello! 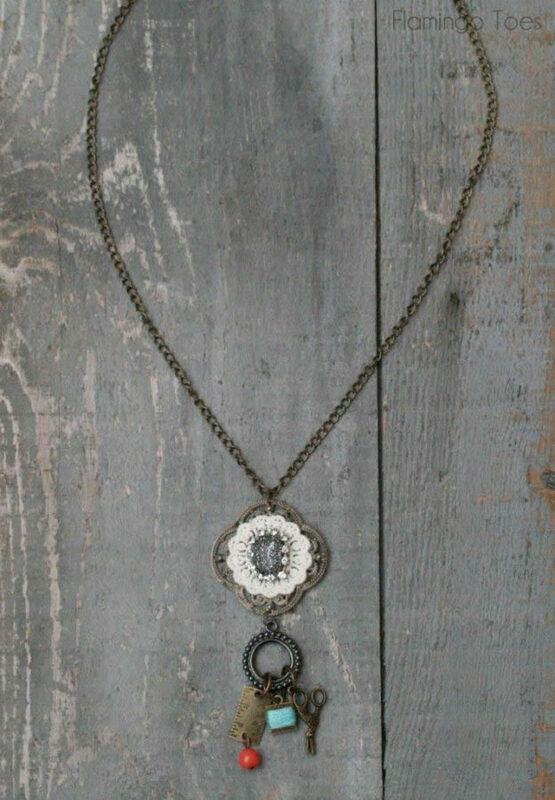 !Charm necklace is very nice to wear..Thank you that you share this information….